It's that time of the year when you can never have too many scarves! 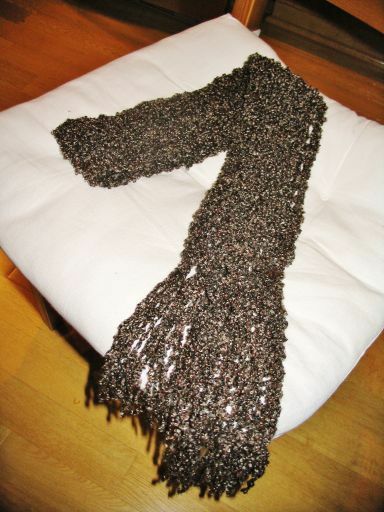 Knitting a scarf can take a very long time... if you use small needles. 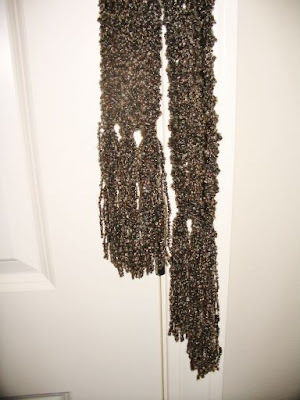 I completed this scarf in just three evenings - while watching television. Using 9mm (US 13 size) knitting needles made it easier to work with this nubbley yarn - it would have been difficult to use this yarn with thinner needles. 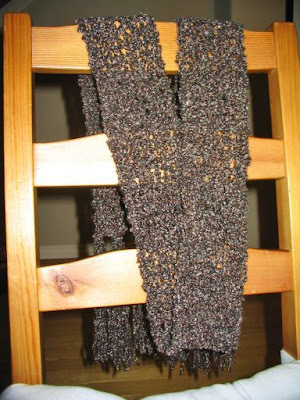 The larger needle size also meant a looser knit but a faster project. I'm not an expert knitter (I'm self-taught via online tutorials), but I believe you would call this a knit 1, purl 1 pattern. What I did was knit one row, moving the yarn from the left needle to the right needle, then flip it over for the next row, continuing to move from left to right. After finishing, I added three tassles to each end.